Whether you’re out on a construction site, your own backyard, or helping out a buddy on their property, a jobsite radio is a surprisingly good investment. Not only does background music help ease the monotony and keep production up, some of the best jobsite radios have the ability to extend a power source, charge batteries for cordless tools, and more. Probably the biggest universal drawback is that there currently don’t exist any units with universal chargers, so the final decision will often come down to which brand of cordless tools you already use. That said, the top model reviews below cover three of the most commonly used brands of power tools you’ll find on a job site. If you don’t plan on using the charging capabilities of the radio, any of these choices are great options. Note: The Bosch and Makita models have built-in Bluetooth capability while you’ll need to purchase a separate Bluetooth adaptor for the Dewalt. The PB360C is the updated version of the top selling PB360S and is perfect for anyone in need of some great sound at the jobsite. Powered by either the included 18v Bosch lithium-ion battery or through a standard 120v outlet, this radio features 20 FM and 10 AM presets, advanced digital tuning, separate bass/treble, and enough connection options to hook up almost any media device. The included Bluetooth connectivity is what most will use. Simply connect to your iPhone, Android, or other smartphone, and you can listen to iTunes, Spotify, Pandora, Google Play, or whatever other tunes you can access, and enjoy the loud, quality sound from the 4-way speakers. With a Bluetooth range of up to 150 feet, it’s perfect for construction sites. The PB360C can charge Bosch batteries and includes four 120v AC outlets, transforming your jobsite radio into a centralized power station for tools and other electronics. Your cordless drill or circular saw will never run out of juice as long as you have a couple extra batteries. Speakers are mounted at the 4 corners of the box for superior 360-degree sound distribution, and the box is durable enough for the most demanding jobsite conditions. 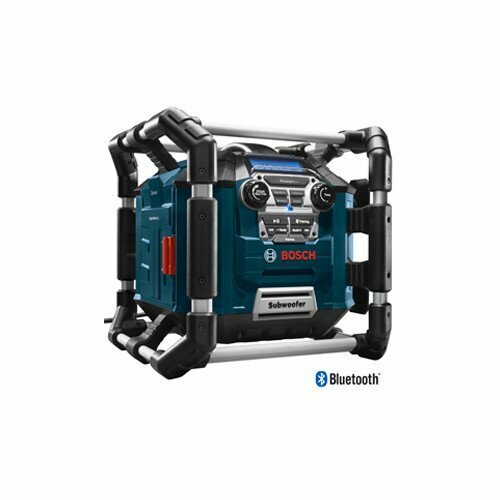 While the Bosch PB360C may be the top jobsite radio for most users, it does have a limitation. The 4 outlets are not GFCI, so this radio will never pass a safety inspection for power distribution. But it is lightweight and offers enough choices to fit into any work crew, including a USB port for charging cellphones or other personal devices. 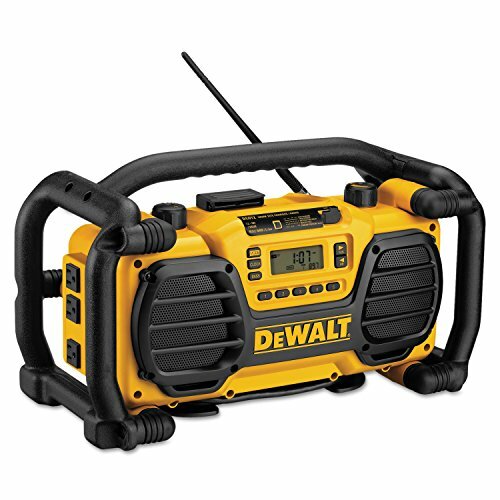 Dewalt’s DC012 is an excellent jobsite radio for the money, and an even better bargain if you already have Dewalt cordless tools that operate on anything from 7.2 to 18v. When plugged into an AC source, the battery for your cordless jigsaw can be fully charged in about an hour, but the unit is versatile to run from the same batteries when external power is not available. The speakers are weather resistant, and there are 6 presets available for AM and FM stations, or plug in your iPhone or MP3 player to listen to your customized selections. The unit includes three 120v AC outlets, and comes from one of today’s most popular names in corded and cordless workplace tools. Charging the entire spectrum of Dewalt lithium-ion batteries is also a big step in the direction of universal supply. 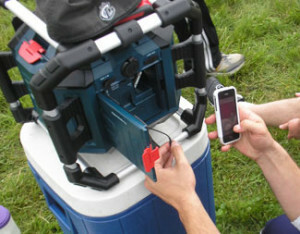 You may still be limited to a single brand, but at least this unit will charge batteries for a wide range of products. While there is no built-in Bluetooth, the optional Dewalt DCR002 Bluetooth Radio Adaptor is available. Note: For those who use Dewalt’s 12v Max or 20v Max batteries, be sure to check out the Dewalt DCR015. The LXRM04B is one of the better jobsite radio choices, but it has some limitations that prevent it from ever being our number one pick. 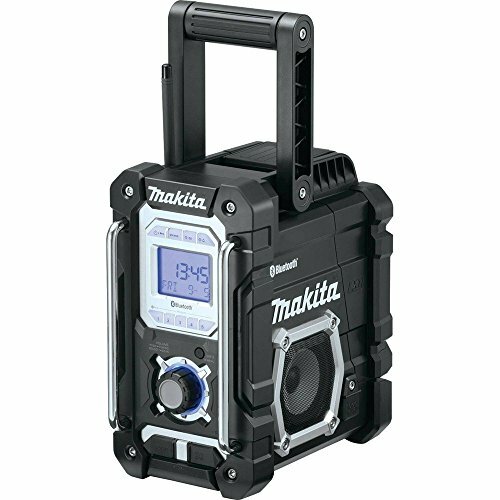 It’s compact and lightweight, but operates only on Makita’s LXT 18v lithium batteries. It has charging/data ports for iPods and other devices, but does not accept or provide 120v AC current. The built-in Bluetooth capability is great but doesn’t seem to have the same range as the Bosch. For remote jobsites with limited power availability, the Makita XRM04B is a good option since the LXT batteries can last for as much as 20 hours on a charge. It’s built to stand up to harsh conditions, but does not provide enough functions to be extremely useful in them. While it is very portable, the sound quality is not at the level of the two models above. While there’s no deal breaker on the Makita and it’s great for certain conditions, it just does not have the power distribution capabilities of the leading competition.